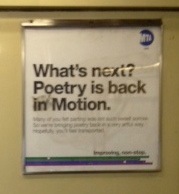 After the year of Shake the Dust (as 2011-2012 shall henceforth be known), this seemed a relevant sign to ponder on the subway. A major side effect of being a poet who produces poetry projects is headspace-loss. I would say it’s an even bigger issue than time. Two days after the final Shake the Dust Weekend, I was aware of a chink, an itch in a part of my brain I hadn’t visited for a long while. Maybe the edges of a tiny idea. I’m still tentatively coaxing that feeling back, weighing excitement and fear at the expanse of time ahead of me to explore poetry itself, for myself. The motion is slight for the moment, but just perceptible, under the avalanche of thoughts and noise belonging to a move between continents. This entry was posted in New York Notebook and tagged New York Notebook. Bookmark the permalink.